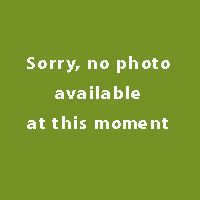 This plant is suitable for gardens with several (nearly) mature trees and shrubs. Calls for a spot in partial shade and a humus rich soil with few roots in the local area. Use it in filtered light through the shade of trees or shrubs to place, but not too close to it. This plant is also used as a border plant (on a slightly sunnier spot). Soil should be moist or well. Hardly invasive and can be combined with other plants. This plant is suitable for gardens with several (nearly) mature trees and shrubs. Calls for a spot in partial shade and a humus rich soil with few roots in the local area.Use it in filtered light through the shade of trees or shrubs to place, but not too close to it. 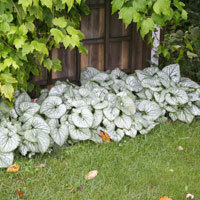 This plant is also used as a border plant (on a slightly sunnier spot). Soil should be moist or well. Hardly invasive and can be combined with other plants. An improvement over ‘Langtrees’ heavier silver bars connect to from a silver collar around the perimeter of the leaf. Very light silver dusting over the entire leaf. Baby blue, forget met not type flower. 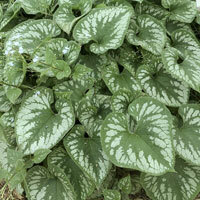 Heartleaf brunnera. Silver and gold sport of ‘Jack Frost’. 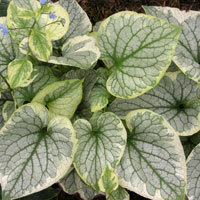 Hear-shaped leaves display a creamy yellow margin and light frosting over the silver leaves. Margins lighten to creamy white by summer. Blue forget me not type flower. 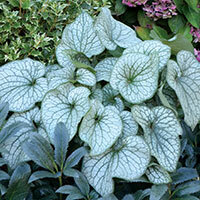 The Brunnera macrophylla 'Variegata' has very decorative, heart-shaped leaves in spring, and blue. forget-me-not-like flowers. 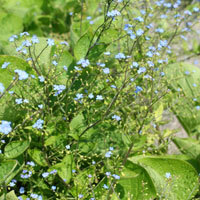 Brunnera the blooms about 8 to 10 weeks and at the end of summer often flower again. Great for beds that are not in full sun.